The foundation of the house is one of the most complex and expensive elements of its construction. At the same time, the process of its creation is very long - in most cases it is the limiting stage of construction. Unfortunately, it is not uncommon for unscrupulous developers to consciously violate technologies and norms in order to quickly complete the foundation and move on to the next stages of work. Often, the customers themselves are pushing them to it, and it seems to them that nothing happens on the construction site for too long. Excessive rush at this stage leads to the fact that in a short time the tenants of the new house have problems - the foundation sags, and as a result of this, the whole structure begins to slowly collapse. Is the golden mean possible here? Is it possible to quickly mount a solid and reliable foundation? It turns out possible. Screw piles come to the rescue in this case. To create a foundation on screw piles, it takes not one or two months, but only a couple of days. Why are similar piles still not used everywhere? Why don't new homes grow as fast as mushrooms after rain? 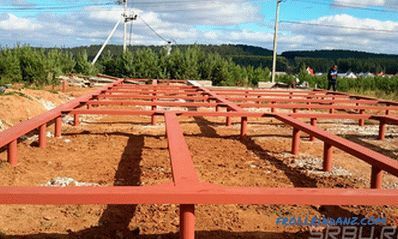 To answer these questions, you need to know not only the advantages, but also the disadvantages of screw piles for the foundation, to have an idea of ​​what limitations their use exist. Remember that building a foundation is a very responsible business, and when choosing a design solution, you should rely first of all on your own knowledge, and not on advertising assurances of manufacturers, promises of builders or examples of neighbors and acquaintances. The history of screw piles has nearly two centuries. A coup in the area of ​​foundation engineering was succeeded by the talented Irish engineer Alexander Mitchell. 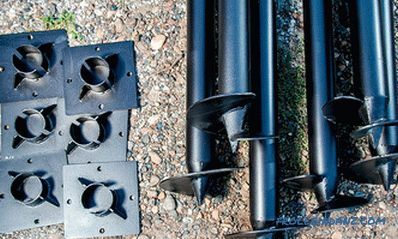 In 1833, he patented Mitchell's “screw piles” that could be installed in moving soils, such as the sandy bottom of a reservoir or muddy bank. The first large structure erected on such piles was the Maplin Sand lighthouse, built at the mouth of the Thames already in 1838. Its foundation consisted of nine piles with screw tips with a diameter of 120 cm, twisted into the ground to a depth of about 7 meters. In subsequent years, under the leadership of Mitchell, several more lighthouses were erected throughout England. Some of them have remained unchanged to this day. In the middle of the 19th century, more than 150 lighthouses in North America, a breakwater in Portland, an overpass and bridges in Bombay, a railroad in Baroda, a pier in Madras and many other important objects were built using Mitchell's piles. In Russia, we learned about screw piles only in the second half of the XIX century. Russian engineers quickly appreciated all the advantages of this invention, especially when working in the permafrost conditions of the northern regions of the country or weak, flooded soils of coastal areas. Very soon, screw piles began to be widely used in the construction of engineering structures for military use (frame-screw support for high-speed construction of the foundations of collapsible bridges is still used by our military), and later in civil engineering. Steel screw piles are widely used around the world today. Their help is resorted to where a high speed of foundation construction is needed: when installing various types of supports, deploying pumping and drilling stations, laying pipelines, building temporary camps for workers, etc. This product enjoys the greatest demand from oil and gas companies, at military and industrial builders, at the companies which are carrying out recovery work. Construction organizations involved in the construction of residential buildings are on this list, but far from leading positions. Of course, the foundations for screw piles for residential buildings are erected, but in most cases we are talking about building in hard-to-reach areas or areas with difficult ground, about repairing problematic foundations of old houses, about fixing buildings on the slopes. What are the screw piles that so quickly gained popularity among builders around the world? What are their varieties? What characteristics of screw piles should you pay attention to first? 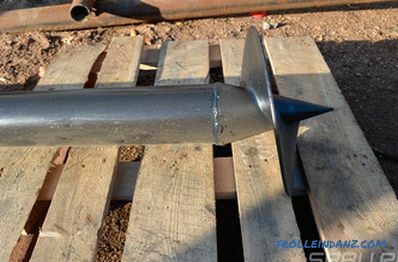 A screw pile consists of a shaft and a blade located at its end. Thanks to the latter, this type of pile is buried in the ground by screwing, rather than driving. 1. Trumpet. 2. Cap, which is attached to the top of the pile. 3. Spiral blade. 4. Anti-corrosion coating. 5. Technological hole for setting the rod. There are several types of steel screw piles. The choice in favor of one type or another is made on the basis of the analysis of the soil features in this area and the expected load on the foundation.Often, even at the same site, different types of piles are used, which allows to evenly distribute the load. 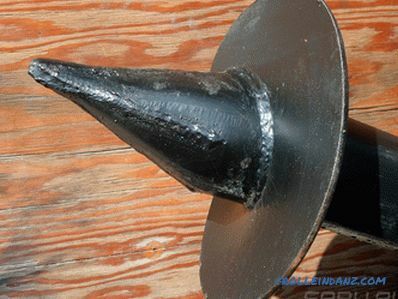 The tips of screw piles, which serve to facilitate their immersion in the ground, can be welded or cast. A screw pile with a welded tip. Cast tips are significantly more expensive, and their use is justified only in the case of working with particularly dense soils, including permafrost, as well as containing large inclusions of natural or man-made origin. Durable cast tip when screwing in the pile easily destroys obstacles in its path and is not deformed in this case. A screw pile with a cast tip. By the number of blades, the screw piles are divided into single and multi-blade (the number of blades on one trunk in some cases can reach six pieces). The first are designed exclusively for dense soils with low mobility. The second ones are more universal, although their main purpose is weak soils with low bearing capacity, since multi-felled piles are more resistant to various types of loads - pulling or, on the contrary, depressing, as well as horizontal. The maximum efficiency of multi-blade screw piles can be achieved by correctly selecting the number of blades, the optimal distance between them, their pitch and angle of inclination. 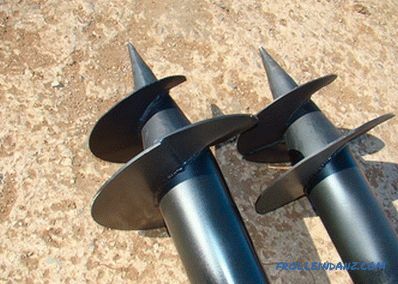 By the size of the blades, the screw piles are divided into wide blade (the diameter of the blades is at least one and a half times the diameter of the trunk) and narrow blade. Due to the increased bearing area, broad piles are very effective in weak soils. For narrow-blade ones, their specialization is especially dense or very frozen ground (it is impossible to “screw” a wide-blade pile into such a ground because of the greatly increasing risk of breaking or deforming the blades). 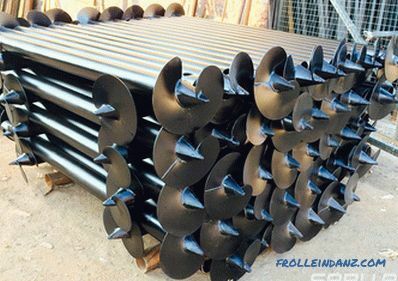 The diameter of the blades of the screw pile in accordance with the international standard ICC AC358 (Helical Foundation Acceptance Criteria) can vary from 200 to 350 mm. 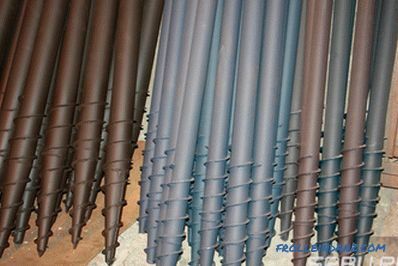 The most important structural characteristic of a screw pile is the thickness of the metal from which the walls of its shaft are made. The calculation of the required thickness is made on the basis of not only the expected load on the pile, but also the conditions of its operation. The fact is that a decrease in pile wall thickness due to corrosion processes ultimately leads to a reduction in its service life. According to the aforementioned ICC AC358 standard, the minimum wall thickness of a pile shaft should be 8 mm in neutral soil and 9. 5 mm in soil with increased chemical activity. Domestic engineers, of course, also realized the importance of such a parameter as the thickness of the metal used for the manufacture of screw piles. In the reference book "Piles and pile foundations", issued in the USSR in 1977, it was stated that the pile shaft should be made of seamless pipe, produced by hot rolling, with a wall thickness of at least 10-14 mm. 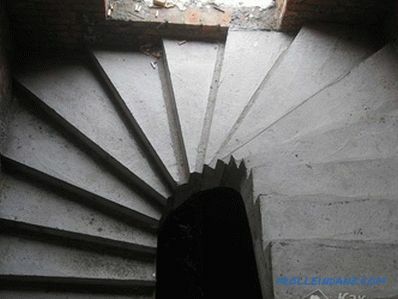 However, in the modern Russian construction standard JV 24. 13330. 2011 "Pile foundations" such a parameter as the thickness of the walls of the screw pile shaft is not considered at all and is not standardized. It is important to make assumptions about why this happened, we will not be here, the result is important. 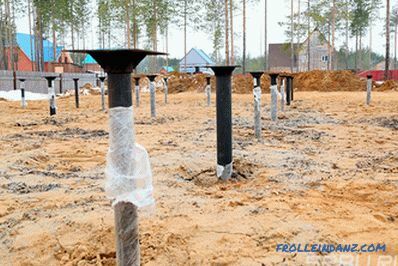 Many domestic manufacturers use the absence of strict requirements for the construction of steel piles in Russian standards and consciously ignore international standards. The desire to get the maximum profit leads to a loss of quality. For most screw piles produced in our country, the wall thickness does not exceed 3-4 mm. 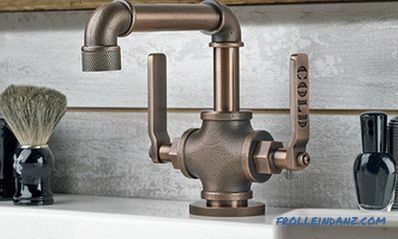 At the same time, they are made of welded pipes with reduced corrosion resistance. 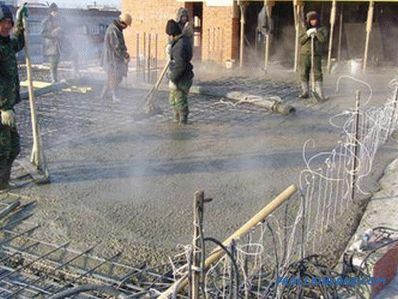 Yes, and the quality of the protective anti-corrosion coating, as a rule, wants the best: it is often "sprinkled" already during the transportation of piles. Of course, Russia can produce (and not only can, but also produce!) Piles, the quality of which meets all the requirements of the international standard ICC AC358. However, due to their high cost, in most cases they do not compete with conventional reinforced concrete piles installed in a pre-drilled well. It is necessary to take into account the thickness of the metal, not only the pile shaft, but also its blades. When building temporary or light objects, it is permissible to use piles with blades thinner than 5 mm. In the construction of large structures designed for long-term operation, the international standard recommends the use of piles, the blade thickness of which is 9. 5-12. 5 mm. To reduce the influence of corrosion processes on the strength characteristics of a steel pile installed in aggressive soil, not only increase its wall thickness, but also apply an additional protective coating. The most commonly used methods for anticorrosive protection of steel piles are galvanizing and applying a special polymer (polyurethane, epoxy, etc.) coating. 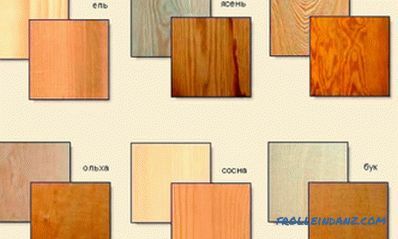 According to ICC AC358, the thickness of the protective polymer layer should not be less than 400 microns. High installation speed is perhaps the most important advantage of screw piles, because in the construction business time is valued like nothing else. The screw pile is ready for operation immediately after installation. Even concreting the internal lumen of the pile shaft does not lead to forced downtime at the construction site: there is no need to wait for concrete to gain brand strength, since the load on the pile is primarily perceived by its steel shell. Low noise at installation is the main advantage of screw piles over driving. The process of driving the latter into the ground is accompanied not only by noise, but also by vibrations. Vibration impacts on the ground can cause damage to various structures located in the immediate vicinity of the work site. 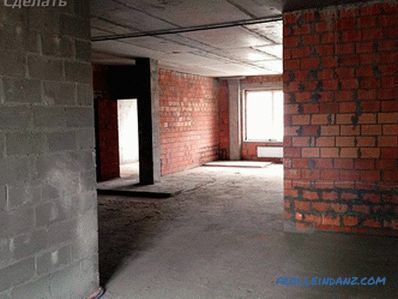 The low cost of the foundation on screw piles in comparison with the cost of all kinds of reinforced concrete foundations is achieved primarily due to a significant reduction in the volume of ground works. This ability is due to the presence of blades on the screw piles. 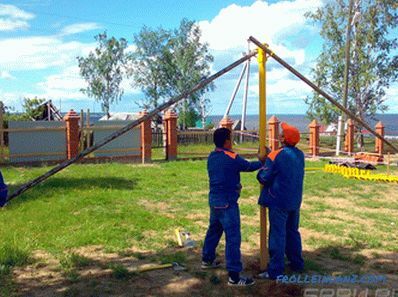 It is because of their blades that these piles can be installed on uneven platforms (which means they are perfect for buildings located on slopes) and at any angle to the vertical. The insignificant amount of soil displaced during installation of the screw piles allows work to be carried out close to the existing buildings. The weather and climate unpretentiousness of screw piles is expressed in the fact that they can be operated in a fairly wide range of temperatures, are not afraid of rising groundwater and swelling of the soil, and hence do not require mandatory drainage of the site where the construction is underway. One of the applications of screw piles is the construction of temporary structures. After such a construction has completed its functions and is dismantled, the screw piles can be removed from the soil and, if necessary, reused. It is worth noting that only industrially produced screw piles, whose quality conforms to the International Construction Standard ICC AC358 Helical Foundation Acceptance Criteria, have all these advantages. The use of screw piles has a number of limitations, which many manufacturers, unfortunately, try to keep silent about. In conditions when the companies involved in the installation of foundations are easy to violate technological standards, you, as a customer, need to have at least a general idea of ​​when screw piles are undesirable or completely unacceptable. Construction of buildings on foundations of screw piles is allowed only in areas with no or, in the limit, with moderate seismic activity. Steel screw piles should not be used in soils with electrical resistance less than 10 Ohm * m, in soils with pH less than 5. 5, as well as in soils high in organic compounds. The reason for these restrictions is the high rate of electrochemical corrosion of steel under these conditions. The responsible developer, who is not indifferent to the question of the durability of the structure being erected by him, before making a decision on the use of steel screw piles, is simply obliged to determine all the necessary characteristics of the soil on a given building site. If it is not possible to determine the aggressiveness of the soil, it is necessary to adhere to the requirements adopted for piles installed in soils with very high corrosive activity. Slag heaps and landfills for construction debris can be attributed to the same category of soil. Any solid inclusions can damage the blades or even the shaft of a screw pile during its installation. These include, for example, peat, loose, silty sands, etc. If the need to install such piles in flowing soil is all there is, it is necessary either to reliably connect them with each other, or to significantly deepen. In accordance with the requirements of the ICC AC358 standard, the screw pile in dense soils should be buried at least by 1. 5 m, while in soft soils - at least by 3 m.
Let us give an example: installation of a screw pile 2, 5 m in the area where the peat bed is located at a depth of 2 m is unacceptable, since in this case the pile will be deprived of the necessary lateral support of the soil. Advertising asserts that the foundation on screw piles can last for at least a century. Is it really, or is it just another trick of marketers? Practice shows that this is quite possible, because some of the lighthouses erected under Mitchell still stand today. However, we are more interested in the fate of not some lighthouse in faraway Europe, but a small country house somewhere in the Moscow region, in the Urals or on the banks of the Yenisei. How much will it stand when erected on a foundation of screw piles not made somewhere and once, but here and now? On the basis of the experimental data, the service life was estimated steel screw piles in soils with different electrical resistance. According to these estimates, in soil with low corrosiveness (for example, dry shale or dry sand), piles of non-galvanized metal will last at least 300 years, and of protective-coated metal, 800 years or more. Impressive, isn't it? However, it is a soil that is ideal in terms of its ability (or rather inability) to cause metal corrosion. Consider for comparison another limiting option. In soils with very high corrosion activity (sea soil, silt, wet clay, peat), the average predicted service life of a steel screw pile is only 30 years (if the pile is made of galvanized metal, this figure will increase to 70-75 years). One important reservation should be made. In carrying out all these calculations, it was assumed that the pile was made in accordance with the ICC AC358 standard used in the West, i.e. the thickness of the walls of its trunk is 8 mm. 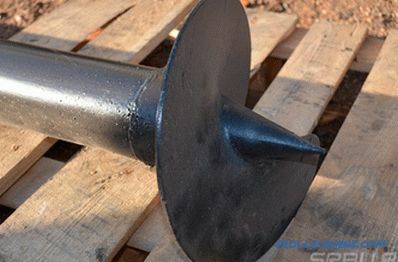 But to find in the Russian market screw piles of hot-rolled steel pipes with such wall thickness is almost impossible. How long a “standard” domestic production will last in an aggressive environment, i.e. a pile made of a welded pipe with a wall thickness of 3-4 mm, is not known to anyone, but obviously significantly less than 30 (75) years. From the above, it follows that the 100 years of foundation service on screw piles promised in advertising are nothing more than empty words. Piles can serve both substantially more and substantially less - it all depends on the quality of the products and the operating conditions, about which not a word is said in the advertisement. chemical activity of the soil in this area. Without knowing these characteristics of the piles and operating conditions, one cannot even make assumptions about how long they will last. The practice of scalding of screw piles with bundles of metal channels or corners, widespread among our builders, contributes to a decrease in the service life of screw piles. Of course, the installation of such ligaments between piles is justified when installing the foundation in the ground with weak lateral support. However, the connection of steel piles with jumpers of conductive material accelerates the electrochemical corrosion of the metal. In order to avoid stray currents contributing to the acceleration of corrosion processes, steel piles should not be galvanically connected to each other, as well as to other building elements made of steel. To connect the piles into a single system, you should use a wooden strapping or metal strapping, the elements of which are connected to the piles by means of clamps insulated from the piles by a dielectric material. That's all that we wanted to tell you today. Now you know all the pros and cons of screw piles and, hopefully, understood the main idea that we were trying to convey to you. 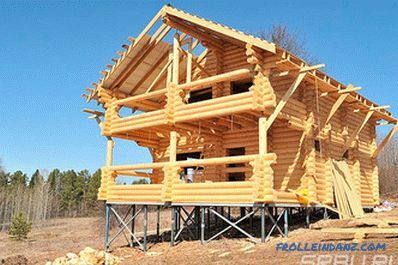 Screw piles are an excellent choice for creating a foundation, but they can not be used always and everywhere. Determine the validity of the use of screw piles in each case only a professional can.Believe me, the cost of attracting a specialist is disproportionately less than the cost of eliminating errors made in the process of designing and building the foundation.